Custom Chocolate Construction gifts - perfect powertools. Build the best gift possible for the Construction worker in your organization or in your personal family. Choose Milk or Dark Chocolate. Packaged stock in white box. Options Available. 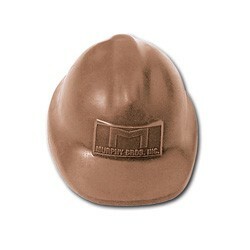 The Large Safety Hard Hat can be personalized. The imprint area is 1" x 1/2". Size : 3" X 2 1/4"